For your holiday in Japan, Club Med invites you to discover Hokkaido, the northernmost island of the archipelago. You’ll be enchanted by the beauty of the Hokkaido Resort, amid exotic and sumptuous landscapes – mountains, plains, rivers and lakes. Personal welcome, baby-care material available in your room and/or in the baby feeding and equipment room (cot, changing mat, baby bath, high chair on request, bottle-warmer), sweet and savoury baby foods, baby corner equipped to prepare babies' meals, high chairs and/or booster cushions in the restaurant. Spare pushchairs are also available if required. The Pyjamas Club® leaves parents free to organise their evening as they wish. This group babysitting service run by experienced G.O®s in a dedicated area provides all the necessary comforts (beds, daybeds, video area, etc). The largest Sports School in the world is all yours! Exceptional sports and group lessons for all levels of skill. Beginners and experienced sportsmen enjoy exclusive, fun teaching from G.O®s trained in their discipline. Indulge yourself to the extreme and discover new emotions. Comfortable and elegant Club accommodation. All the rooms have futons (Japanese-style bed on tatami). A spacious Deluxe Room offering generous comfort in an elegant atmosphere. Some of the bedrooms have futons (Japanese-style bed on tatami). A spacious and elegant Suite which ensures you of premium comfort, equipped with futons (Japanese-style bed on tatami). In line with Japan local law, Club Med is only allowed to serve alcoholic drinks to our guests above 20 years old. Your senses will receive a delicate awakening thanks to the international dishes with a special focus on traditional Japanese cuisine served at The Daichi's buffet. Parents can prepare meals for their little ones in the Baby Zone in this restaurant with a relaxed atmosphere. Champagnes, VSOP and XO spirits, bottled and canned drinks are available from vending machines in some of our Resorts and/or at the Club Med Boutique. Certain super-premium brands and bottled wines are also available à la carte in some of our restaurants and bars. Enjoy stunning mountain views while sipping a refreshing beverage amidst elegant Japanese décor in this stylish bar. When the sun goes down, we offer a lounge-like atmosphere where staff will serve you the snack of your choice. For a family affair, feel free to treat your kids to non-alcoholic drinks and sweets in our designated children's area. 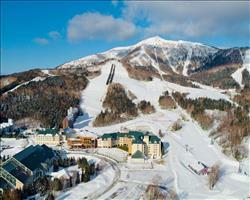 We update Club Med Sahoro Hokkaido's details often, but facilities do change. e.g. some extras listed by the supplier as "free" or included might only be for the first time you use them, or for one time per party, then charged for further use. If any specific feature is essential to your holiday, make sure you ask us to confirm the details of it before you book your holiday. This all inclusive holiday to Club Med Sahoro Hokkaido in Sahoro, Japan departs Friday 29th November 2019, for a 7 night stay on a "all inclusive" board basis. Experience the Japanese ski scene in Hokkaido’s small resort of Sahoro – home to corduroy pistes, thick forest and the all-singing, all-dancing Club Med resort. Sahoro lift pass price last reported as 28,980 yen (adult 6 day). Ask for a quote when booking Club Med Sahoro Hokkaido. Sahoro has S SE facing slopes. Club Med Tomamu H... Tomamu Japan, Without Flights to Without Flights 7th December.